I found this awesome PowerShell script on Gary LaPointe’s blog and decided to give it a try. This essentially mimics the SharePoint Configuration Wizard, but it gives you the power to use PowerShell! Below are is my experience with this script and how I went about removing the GUIDs from the database names. Note: This bases the DB Server off of the default DB Server specified in Central Admin (Can be change using PowerShell Later) and it results in databases with GUIDs at the end, but we’ll remove those later :). Obviously change the Managed Account and App Pool names to fit your environment. This will result in a default topology, but there are GUIDs..yuck! 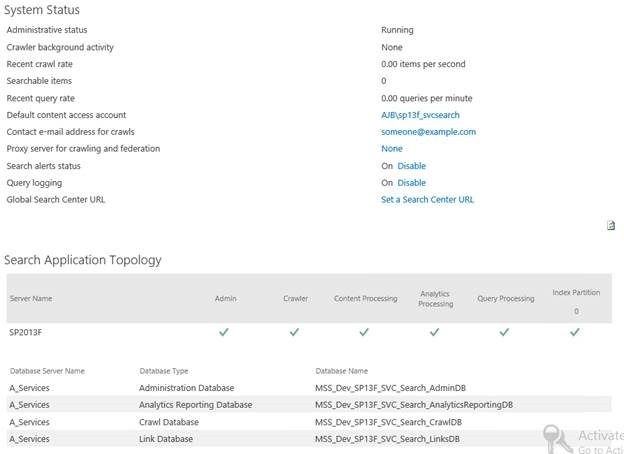 If GUIDs are unacceptable there is a method of renaming Search Service Databases on http://technet.microsoft.com/en-us/library/jj219654.aspx. I went ahead and tried this out. 7. Restore the old databases (Delete MDF and LDF Files first! May need to close out SQL Mgmt Studio). $ssa | Set-SPEnterpriseSearchServiceApplication -DatabaseName "MSS_Dev_SP13F_SVC_Search_AdminDB" -DatabaseServer "A_Services"
$CrawlDatabase0 | Set-SPEnterpriseSearchCrawlDatabase -DatabaseName "MSS_Dev_SP13F_SVC_Search_CrawlDB” -DatabaseServer "A_Services"
$LinksDatabase0 | Set-SPEnterpriseSearchLinksDatabase -DatabaseName "MSS_Dev_SP13F_SVC_Search_LinksDB" -DatabaseServer "A_Services"